Toshiba Corporation today announced its next-generation 24-nanometer (nm) generation “SmartNAND” memory chips which have integrated control chip supporting error correction code (ECC), allowing enhanced speed performance of 1.9 times faster read speed and 1.5 times faster write speed than current line-up. The new memoty chips are available in 4GB, 8GB, 16GB, 32GB and 64GB capacities, and are targeted for portable media players, tablet PCs, information equipment, digital TVs, set-top boxes and other consumer digital products. 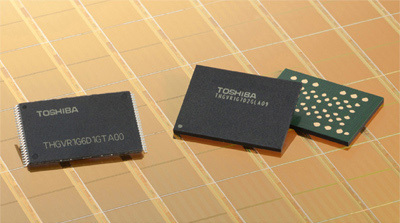 Toshiba’s SmartNAND utilize a standard raw NAND interface, allowing easy replacement of standard NAND and can be applied to existing host controllers. Samples of the new SmartNAND line-up will be available from middle of April, and mass production will start in the second quarter of CY2011 (April to June).